As always, these are my personal views, but it’s probably worth reiterating at the outset. I am not a fan of exclusivity, for a number of reasons. Let’s start by looking at the streaming music market. We continue to see fairly significant growth in this sector with companies like Spotify, Apple, Deezer, Google Play Music and Tidal all attempting to grow themselves. One of the key ways that they tried to do this was with exclusivity – having unique access to a particular artist’s new music. Tidal could do this, because of their relationship with artists; Spotify could do it because they were big in the sector; Apple could do it because, well, they’re Apple and could hire the Roundhouse in London for a month and fill it with music stars. But by and large, exclusivity has disappeared from music streaming services, and they instead fight on things like features and the communities they create. It’s not consumer friendly for me to need to go to Tidal for one artist’s album, but Apple for another’s. Some of the record labels ended up rejecting the idea – notably Universal. In the end it was seen as anti-competitive and harmed both the audience and artist. None of this stops a service offering exclusive live sets, interviews or introductions, but in general terms you can hear the same music across most of the services. We don’t expect to get one set of TV exclusives if we buy a Samsung TV and another set of exclusives if we buy a Sony TV. As a consumer, I make a choice of what TV I buy based on a number of criteria, and then can watch whichever services I like on that TV. But let’s drag this back to audio, and in particular podcasts. Until fairly recently, podcasts were defined by their technological delivery mechanism – i.e. RSS feeds. I would argue that this is still the case. However, as the podcast industry continues to grow, we have seen, and continue to see, a lot of attempts at driving consumption to a particular platform by making podcasts exclusive to that platform. Stitcher, for example, kept its Wolverine podcast exclusive to its platform for many months – employing what is commonly known as a ‘windowing’ strategy. If you want to listen immediately, you have to use their platform. Later, they made the podcast available as a conventional RSS feed and thus listenable on any podcatcher. Amazon’s Audible service has always been a subscription service, and continues to evolve. It has recently released The Last Days of August exclusively to its subscribers. This follows a previous podcast also written and presented by Jon Ronson, The Butterfly Effect. That series was similarly an Audible exclusive before later being released in an advertising-funded form as a regular RSS-delivered podcast. In a recent Hotpod newsletter, Nick Quah notes that both Spotify and Pandora are attempting to use podcasts to both retain listeners to their platforms and keep them listening longer. Previously Spotify only offered a limited number of podcasts that they essentially curated. But that just meant that a Spotify listener who wanted to hear their own choice of podcast had to open a different app to hear all the podcasts of their choice. So in October, Spotify opened up their platform to all podcasts. Spotify has already become the [distant] number two platform to Apple Podcasts, but that does mean that as a podcast producer, you probably want to list your podcast on Spotify. Spotify has commissioned exclusive podcasts series from time to time. Recently, for example, there was The Joe Budden Podcast which was exclusively on the platform. On the other hand, another Spotify original, Amy Schumer Presents: 3 Girls, 1 Keith, was available on all platforms. Now Spotify has bought Gimlet Media for an amount thought to be $230m. Gimlet, the maker of podcasts including Reply All, Homecoming, Startup and Crimetown, positions itself as a top-end podcast producer. More than once I’ve heard it described as the HBO of podcast makers. Spotify has also bought Anchor, a podcast creation platform that tries to streamline the process that allows podcast creators to add advertising to their podcasts. Spotify is now in possession of one of the best podcasting companies in the world. But the purported price is high and it’s interesting to explore what’s in it for Spotify. In Daniel Ek’s blog, he says that he expects that 20% of Spotify listening will in due course be non-music listening. And what about advertising? How will that model work? Will all Gimlet’s podcasts be on Spotify’s free platform? Or will some be kept exclusive for Spotify paid subscribers? On the other hand, Recode Media’s Peter Kafka, one of those who initially broke the story, suggested on today’s Media Show that Spotify was looking to give Wall St a new revenue stream. Going fully exclusive on their platform will necessarily limit any new advertising revenues. In the meantime, closer to home, the BBC last year launched BBC Sounds in the UK, and gave it a massive marketing push. Part of that is also keeping some audio exclusive to the Sounds app. So far they’ve mostly adopted a 30 day windowing approach, launching new podcasts like End of Days exclusively on Sounds before making them available more widely. However, at the start of this year, heckles were raised by moving a previously freely available RSS-delivered podcast, Fortunately…, exclusively into Sounds – at least for a few weeks. Fortunately… has just reappeared in RSS feeds and now seems to be fast-forwarding through the delayed episodes that were previously only on BBC Sounds by releasing those episodes one every couple of days! BBC Sounds, of course, is a much more complicated offer, since it offers “Music, radio and podcasts.” ‘Music’ is a new BBC offering – a limited number of playlists not directly related to radio (although often more loosely connected, e.g. a Match of the Day Mix). Whereas ‘Radio’ is a complete on-demand offering of all BBC Radio’s output, including full music tracks. ‘Podcasts’ is interesting, because although it gets its own section in Sounds, it becomes hard to discern where an on-demand radio programme ends and a podcast begins. Notably, the podcast section includes a limited number of non-BBC podcasts. However, as with Audible and Spotify-exclusive ‘podcasts’ before them, none of these are true ‘podcasts’ in the sense that they’re not delivered via public-facing RSS feeds. What we’re ending up with, is a world where lots of different applications are trying to ‘own’ audio. They want to be the place on your mobile device where you spend most of your time listening. And in the commercial world, they want your money too. They might be using AI algorithms to recommend you new listening based on previous consumption, and some are attempting to disaggregate audio to give you more bite sized listening – think the audio equivalent of having less full length programmes on Netflix, but more 4-5 minute YouTube videos. However, does this really work for the consumer? Going back to the TV/video world only gets us so far. On my television I happen to do most of my viewing via my Sky Box. If it’s linear viewing, then it’ll definitely come from there. If it’s on-demand from one of the broadcasters, then it’ll probably come from there. iPlayer, ITV Hub, All4, Sky Box Sets and so on, all come through the Sky Box. It’s the most convenient way to watch everything I’d like to watch. Except, that is, if I want to use something like Netflix, Amazon or YouTube. If I want to watch shows or videos from those providers, then I change inputs on my TV and use my preferred streaming device. In my case, that’s an Nvidia Shield TV. From there, I can get Netflix, Amazon and YouTube – but also iPlayer, ITV Hub and so on. Except that I mostly only use it for the first three. The latter, as I mention, are more convenient on Sky. Either way, there’s not a single way to get to everything. I could be using the smart functionality of my TV, but I tend not to. It’s much slower than bespoke devices. And in any case, the TV on its own might offer most of those services, but it doesn’t help with Sky. Now let’s consider audio in a bit more detail. I break down my audio listening into three types, depending on time of day, mood etc. For Live Radio, I broadly speaking have the choice of a bespoke player from the broadcaster (e.g. BBC Sounds or iPlayer Radio (Hurrah -Chromecast!)) or a radio aggregator (e.g. RadioPlayer or TuneIn). The former group tend to provide more detailed information about programming, and have deeper catch-up functionality. But if there’s a football match on Talksport I want to hear or a radio show on Absolute Radio, then they can’t help. So there’s space for aggregators which can get me everything I want, and allow me to seamlessly jump between providers. An app like RadioPlayer lets me jump between football on Five Live, Talksport and local BBC stations as I need to. It’s much more convenient than downloading every broadcaster’s own app. For Music it really boils down to my music provider of choice. Assuming that I’m a subscriber or free user of a music service like Spotify, Google Play Music or Apple Music, then my app of choice is defined. Neither Google nor Apple integrate podcasts into their audio offerings – Apple very pointedly separated podcasts away from music – so with those apps you are mostly living in a music world. Google for a while had podcasts within GPM in the US, but they too have been shifted them away into their own “sort-of” app. Spotify and in the US, Pandora, are trying to do all things audio, including podcasts and music streams – well, except live radio. For Podcasts, my preferred listening experience is to have everything in one place. 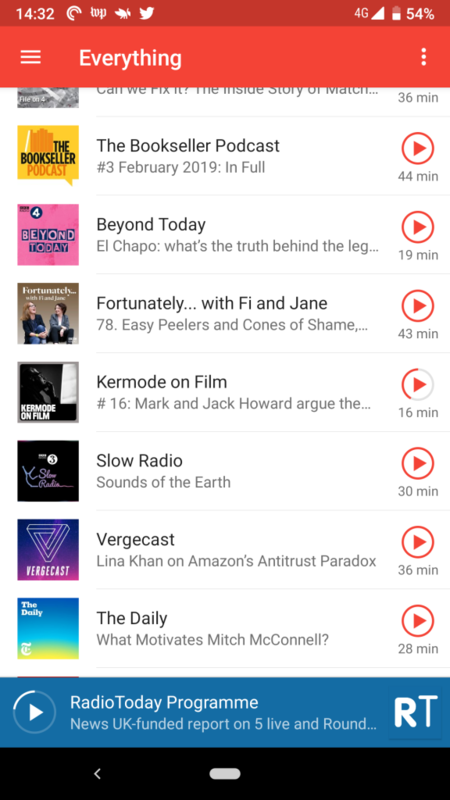 I’ve spoken before about how I use Pocket Casts as my go-to player. 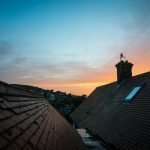 For me, podcasts are a series discrete programmes of various lengths, and I listen to a broad range of them from a multiplicity of suppliers and producers. One minute I’m listening to a BBC podcast, then one from the FT, one from a US public radio station and then an independent. I flit around a lot. Podcatching software has to meet a number of needs. I want to be able to put together several podcasts into a “playlist” that will play back consecutively without me doing anything. That could be listening on a long car journey, or a long cycle ride. I also like multi-platform support, the ability to listen in a browser or via a connected speaker (smart or otherwise). And it’d be great if I could socially share my choices in podcasts. This last thing is unnecessarily hard. Recommendation from AI is fine as far as it goes, but I’ve written repeatedly, I’ve never seen anyone do it well. Given that I already have more podcasts that I can listen to, and I mostly want to hear all of them, getting dodgy recommendations is not top of my wish list of functionality. I repeat – nobody is doing recommendation well. The most critical thing for me is that I get as complete an offering as I can. Spotify actually doesn’t. It’s still up to podcast makers to get themselves listed. BBC Sounds only has a very select list of non-BBC podcasts meaning that I simply can’t use it as a primary podcast player. Also of note, Spotify is not available in every territory in the world. BBC Sounds remains UK only too. Going platform exclusive can mean going geographically exclusive. Spotify, for example, is only in a paltry five African countries. Nigeria has a population of nearly 200m, and Spotify isn’t available there. If you go Spotify-exclusive, you’ve removed the option to listen to the most populous country in Africa. I understand that there are good reasons for what Spotify and BBC Sounds are doing around exclusivity. Spotify wants to be meet all your audio needs. The BBC wants young people to listen to its audio services and to replicate the success of iPlayer on television. But as a non-Spotify subscriber, will I need to install the Spotify app in future to hear Reply All? Because that’s likely to just make Reply All just a little bit harder to listen to. Even if I do install the Spotify app, as a non-subscriber, I’ll rarely be inclined to open it. It’s why I’ve not been listening to Fortunately… since it disappeared from regular RSS feeds. In that case, I do have the BBC Sounds app installed – it plays live BBC radio really fast. But it’s unlikely to become a destination for all things podcasting until it carries every podcast I listen to and has a feature set that beats the current class-leaders like Pocket Casts (IMHO). For me, it’s a handy way to listen to live radio. No more; no less. Will an iPhone user, who had Apple Podcasts pre-installed on their phone, and now subscribes to Apple Music, go out and download another app so that they can hear Crimetown? The path of least resistance is to not notice a new Crimetown episode has been published and instead hear a true crime podcast that is available on Apple Podcasts. There are one or two around. As an aside, it’ll be interesting to see how Apple packages up its upcoming video offering when it launches in the next few months. Could they supersize Apple Music subscriptions, giving them a leg up against Spotify which isn’t investing billions into TV projects with Jennifer Aniston and Reece Witherspoon? Podcasts up until now have been mostly free, and if there’s one thing audiences have shown, it’s that they’re not super-keen on paying for audio. Recall that just because you and I have a paid for music streaming subscription service, the vast majority of the population doesn’t. FM or DAB radio is free. While there undoubtedly need to be a variety of models to pay for audio services, it feels like we’re running before we can walk as everyone rushes in to try to dominate a space. Today, most of the population does not listen to podcasts. For better or for worse, there is still a significant job to be done to teach large numbers of consumers how easy it is to actually get to podcasts. However, instead of making that job easier, we’re quickly heading towards a place where it suddenly gets more complicated. Instead of me directing a potential new podcast user to open Apple Podcasts on their iPhone, or download Pocket Casts on their Android phone, and then simply showing them how to add whatever they want to listen to, I’m instead going to have to ask them what they think they might want to hear, and then direct them to install multiple apps, create multiple user accounts and only then let them hear those podcasts. That’s a bit like telling me that I need to use the Chrome browser to read The Guardian’s website, but must use Firefox to read The Times’ website. Oh, and I should install Edge if I want to read The Economist. Cheers Dan. Good to know. I’ve updated the post above slightly!